John Friday grew up in Washington, DC, traveled the world, and came back home. Then he turned his car south one day, and ended up in Florida. Armed with a guitar, a wry sense of humor, and a keen eye for life’s absurdities, he carved out a niche as a singer/songwriter. John’s four albums, Coastal Dreamin’ , Tropicalized , Coastal Cowboy , and Still In Mexico , have vaulted him to the top of the Trop Rock music world. He is currently writing songs for his fifth album, as well as a holiday album. His musical achievements include: - Trop Rock Music Association’s Horizon Award (2013) - Eight TRMA nominations (2010-2013), including Album & Song of the Year (2013 & 2016) -Landshark Lager Battle of the Bands (2009), 4th place (out of over 400 bands) - Dallas Songwriter’s Association Top 10 (2009-2010) - Great Lakes Songwriting Contest Top 10 (2010-2012) - American Songwriter Lyric Contest Honorable Mention (2010, 2012) John is always on the lookout for a great song, and moves effortlessly through multiple genres, including rock, folk, country, reggae, classical, oldies, and pop. His original songs are filled with insight and humor, and he covers great songs from every decade. 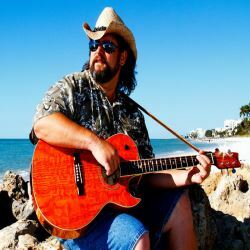 He tours nationally and has shared the stage with artists such as Doyle Grisham, Nadirah Shakoor, Peter Mayer, Mac Macanally & Will Kimbrough (all members of Jimmy Buffett’s Coral Reefer Band ), Jim Morris, John Frinzi, “Sunny Jim” White and Jack Mosley, among many others.